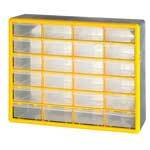 Designed to be stackable, wall mountable or bench top mounted. 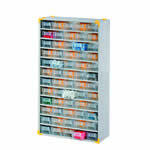 These small parts cabinet are ideal for storing small electronic components that are sensitive to static and need to be stored in an anti-static environment. 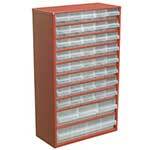 The Sealey and visible storage cabinets are available in a number of shapes and sizes, to accommodate your workplace needs. 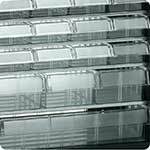 With their clear fronts, components placed into the cabinets, the contents of each box is visible, meaning required parts can be quickly found. 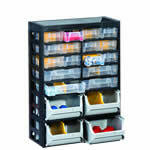 These cabinets can be stacked, wall mounted or freestanding on the floor or work surface. 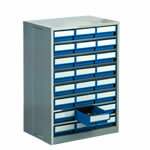 These multi drawer cabinets are available as either static units, where the integrated turntables provide easy access to all sides of the unit, or fitted with wheels for mobile storage. 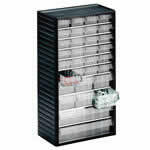 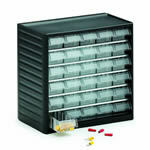 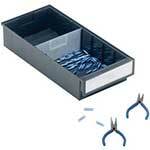 Each cabinet can hold up to 16 storage bins, with storage for an impressive 256 individual bins. 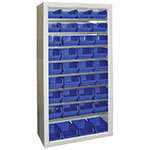 Made from tough materials, these cabinets are made for use in workshops where there is a requirement for storage of small parts. 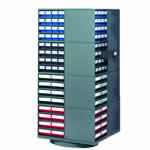 The design of these units means space is maximised and productivity can be increased. 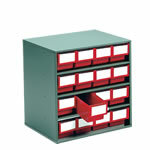 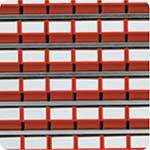 The drawers are available in red, blue or grey and you can add dividers and retaining bars to the storage bins as needed to separate small items and provide more storage.